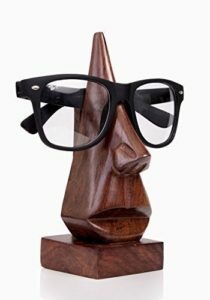 This Hand-Carved Nose Shaped Eyeglass Spectacle Holder will make a perfect and practical gift for fathers or anyone in the office. The eyeglass holder is actually a practical gift. People who need their glasses to read or view documents on a computer screen will be happy to know that their glasses are exactly where they left them. Hand crafted by artisans from India that have used carving techniques passed down from generation to generation.